frankly my dear...: Happy Easter. We're all very excited here......not long now til easter bunny arrives! Oh how i love easter (best time of the year for a chocoholic)! We are heading back to our home town to spend easter with our families & enjoy the great festivities they put on in the township for the long weekend. I have made each of the three kids simple easter bags for the egg hunt on Sunday morning - because god-forbid one has a bigger basket than the other! We can't wait for Scarlett to join in the hunt this year too.........it's hard to believe last year she was just a teeny-tiny baby. 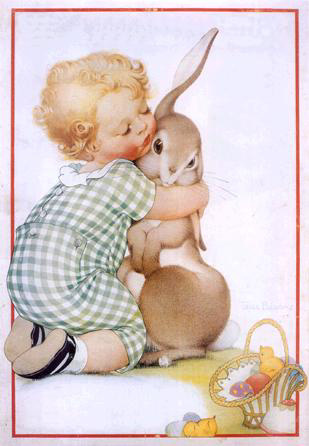 I hope you all enjoy your easter & the easter bunny is kind to you all - if you're travelling on the roads this long weekend, please drive carefully.